Drones have been a topic of some interest since the US military began using them in areas like Afghanistan to track and target suspected terrorists and to deliver missiles or explosive devices to take them out. The military has extolled these very small flying robots as a cheaper and more effective form of warfare. At home, however, there is increasing concern regarding consumer or recreational use of drones pertaining to privacy and safety as a malfunctioning drone can veer into an unsuspecting pedestrian. For these reasons, the Boston Marathon has banned anyone from flying a drone over the race course during its annual event despite their being an effective surveillance tool by law enforcement. Domestically, you can purchase a drone, also known as UCVs or unmanned civilian vehicles, of your own from any number of companies. These flying toys can be bought for as little as $50 to over $1,200 and probably more, depending on what level of sophistication you want. 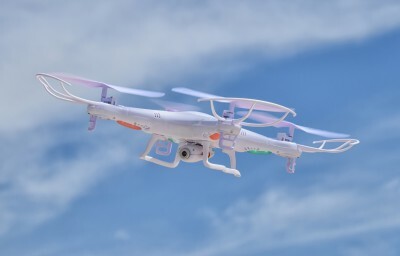 Consumers have been using them for taking spectacular aerial photographs or for pure entertainment, taking the place of remote controlled model aircraft. They can be a nuisance, however, and all national parks ban them since they are noisy, disruptive and can harm wildlife. Last year, a tourist crashed a drone into the Grand Prismatic Spring at Yellowstone National Park. A drone accident can also cause injuries. Anyone who buys a UCV can fly it without training or any other knowledge of its potential to cause injury. At a triathlon event in Australia, race officials hired a private drone owner to use the device to take photographs of the event. It crashed, injuring 4 race participants though fortunately no one was seriously injured. In Virginia, a drone flew into a crowd of spectators, causing multiple injuries. Unlike Australia, however, drone operators in the US are not required to be certified, though this did not prevent the injuries at the triathlon event. A drone can be flown at heights of 400 feet or more and travel at speeds up to 140 miles per hour depending on the type of UCV. A drone crashing into a person or crowd from that height and speed can cause devastating injuries. Regarding liability, there are certain theories that the courts might adopt. One is simple negligence. A drone might also be analogous to a situation where someone who keeps a wild animal that escapes and injures someone is strictly liable. More likely is the theory that the operator would be liable for negligent operation. However, was the operator insured? Regarding model aircraft, some injuries reported each year from accidents and operators are encouraged to purchase specific liability insurance since a homeowner’s policy would likely not cover an accident. Drone users might want to purchase those policies offered for model aircraft users so long as they specifically cover a UCV. Manufacturers might also be held liable for resulting injuries if fail to adequately state how users are to safely fly the UCVs or by not warning users about the risks of flying a UCV and other particulars of the device. If the UCV was used at an event, such as the Australian triathlon, and it crashed into participants or spectators, the event organizers may be named as defendants in an injury claim as well. There is also the issue of invasion of privacy since a drone using a camera can photograph persons without their knowledge or consent so long as they had a reasonable expectation of privacy. Although remotely operating a drone is not difficult, the FAA is considering a certification process and other guidelines that would presumably include safety precautions. You may also pursue a claim of invasion of privacy if the UCV was photographing you. If the photos were used somehow, your claim might include one for casting you in a false light or for damaging your reputation if you can provide such proof. You might be able to recover compensation for mental distress as well. Thousands of drones are being purchased monthly across the US. It is inevitable that a drone accident will occur and someone will suffer injuries. If you or a loved one is injured by a drone or you feel your right to privacy was violated by a UCV taking unwarranted photographs of you, contact Boston injury law firm Burns & Jain. With this new technology becoming more widely available, you need the services a highly experienced personal injury lawyer to get you the compensation your injury claim deserves.